Many foreigners are confused when they see the departure station name printed on the train ticket as 'Beijing'. They are wondering which station it is. In fact, the 'Beijing' here means Beijing Railway Station. It is located just southeast of the city center inside the 2nd ring road (the former city wall). You can call it the main station or central station of Beijing as it was the largest train station in China when it opened in 1959. Although its size now is smaller than Beijing West Station and Beijing South Station, it still remains as the icon of the city. Generally, trains for northeast China, for Shandong and for part of southern China depart from Beijing Railway Station. The international trains to Russia, Mongolia and North Korea all leaves from Beijing Railway Station. How to read the board of Beijing Railway Station? After you have gone through the inspection, you will see the board in the central hall displaying the waiting room number where you can wait for your train. 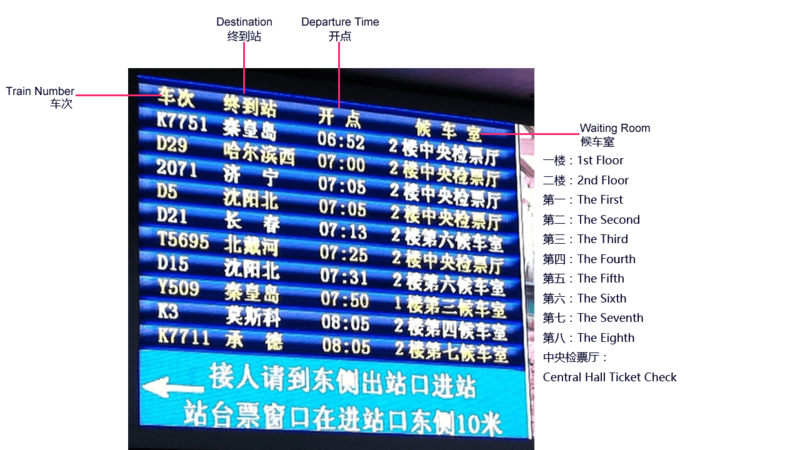 There are four columns: 'Train Number' ,'Destination', 'Departure Time' and 'Waiting Room'. Look at your train number printed on the ticket and you can get your waiting room info on this board. For example: 1楼第三候车室 means The Third Waiting Room on the 1st Floor; 2楼中央检票厅 means The Central Hall Ticket Check on the 2nd Floor.